The Honey Bush, Melianthus major can be one of the most striking specimens in the garden. The Honey Bush is large (up to 12 feet tall, but more often 6 feet). Melianthus major is very sculptural and has strong contrast between the maroon flowers and the large leaved gray foliage. Melianthus major can also get away a bit if you are not looking. Melianthus major runs. The runners are not too difficult to contain but must be watched or they will make for a much larger specimen than you might have intended. The red flowers drip nectar and attract birds like little else. If your goal is attracting hummingbirds, they will stake the Honey Bush out and protect it from all comers, occasionally including the gardener. We have had March visits from the hooded oriole this year. That is quite early for us. The Honey Bush plants are quite drought tolerant, though that is how I prefer to contain them. I give Melianthus major a source of water and leave a desert around them. For such a tropical looking plant Melianthus major is surprisingly frost tolerant. The Honey Bush went through temperatures in the low 20°s F this year and likely into the mid teens in prior years. I grow them in full sun to light shade. Melianthus major has fragrant flowers and foliage that smells like peanut butter when crushed. 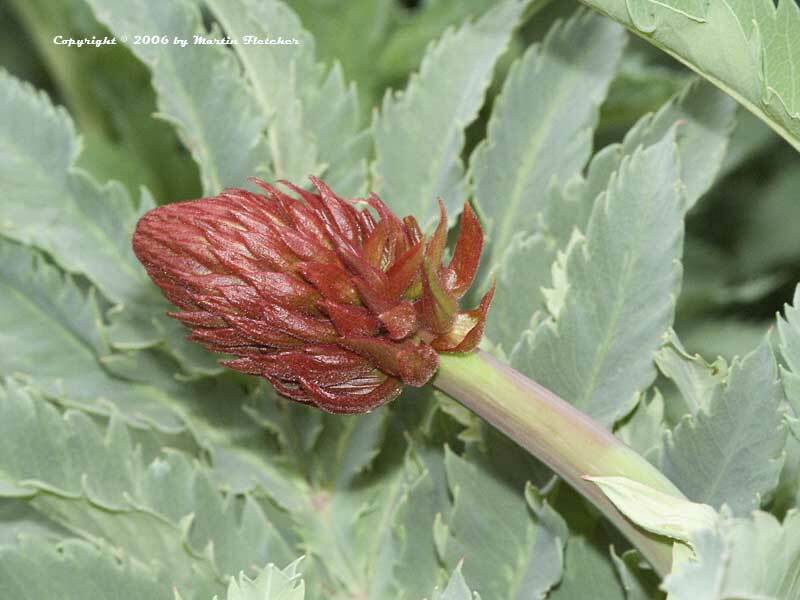 Red flowers backed by grey foliage of Melianthus major - Honey Bush. High resolution photos are part of our garden image collection.